On November 24, 2015, the Centre welcomed Stephen Harrison (Glasgow) to discuss ‘The Battle of Clontarf 1014: Literature, Legend and Landscape.’ Below is this listener’s brief summary of the lecture. Stephen’s research on the Battle of Clontarf began in 2008 with the Irish Battlefields Project, in which over 250 possible battle sites dating from AD 722 – 1798 were investigated to determine whether they should be placed under national protection. The Battle of Clontarf is probably the best known battle of medieval Ireland and is often seen as the turning point in driving out the foreigners of Dublin. The major figures in the Battle of Clontarf are Brian Bóruma and his son who opposed the forces of Máel Mórda, the king of Leinster, Sitric Silkbeard of Dublin, and Sigurd of Orkney. The forces of the latter are described as “foreigners of Áth Cliath” in the Annals of Inisfallen. Later annals added more ancestors as casualties according to the political climate of the time. Stephen’s seminar focused on the Cogadh Gaedhel re Gallaibh and what it can tell us about the Battle of Clontarf. Stephen argued that, although prevoius research has mainly focused on what the text can tell us about the political climate of the time, the text can actually tell us a great deal about the battle itself. 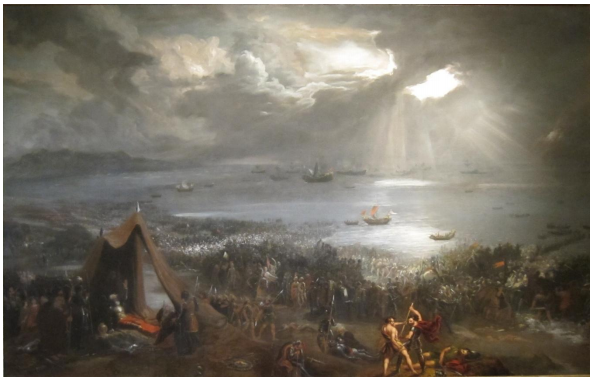 Although the Annals of Inisfallen describe the battle as the “Battle of Áth Cliath (Dublin)”, both the Dublin and Brussels copies of the Cogadh Gaedhel re Gallaibh and a 12th century Munster king list mention the battle as “The Battle of Clontarf” or “The Battle of the Weir of Clontarf”. The actual location of the battle has been disputed for many years. Antiquarians had frequently thought Parnell Square or Conquer Hill were the burial places of the “foreign” Viking dead from that battle, but the Viking graves found in Parnell Square predate the battle and no human remains were recovered from Conquer Hill. In the 20th century, it was believed that the battle took place in the modern suburb of Clontarf. Stephen explained that the oldest portion of the modern suburb of Clontarf is what is known today as West Clontarf. However, due to several medieval sources (such as the Annals of St. Mary’s Abbey), it is believed that the site of the battle took place further west, near present-day Ballybough bridge, just north of the River Tolka. The ramparts of Dublin, from which Sithric watched the Battle of Clontarf, appear to have been located in the excavations at Wood Quay, where a stone wall dating to 1000 AD was uncovered. The text describes the battle beginning at high tide and ending at high tide. The end of the battle is described as taking place at Droichet Dubgaill (Dubgall’s Bridge), likely a fording point on the River Tolka. It seems unlikely that the Vikings, a sea-faring people, would swim out to sea to drown in heavy armour instead of dying in battle; therefore it is more likely that they were taking a calculated risk in trying to ford the Tolka river at high tide to retreat to Dublin. The Cogadh Gaedhel re Gallaibh begins with a confused narrative of the beginning of the battle. In one instance, the Vikings leave Dublin and battle the Irish on land. Some have the Vikings come out of Dublin twice. In another version, the Vikings leave on their fleet of ships, then come back and begin the battle. It is likely that these contradictions arise because the manuscript was compiled from several different sources. The latter, which opens with the Viking fleet, likely meant to emphasize the Viking’s strong ties to the sea, only for the Vikings to be betrayed by the sea as their ships drifted away, resulting in the Vikings drowning in retreat from the Irish. The Cogadh Gaedhel re Gallaibh is a complex text which has drawn on several different accounts of the Battle of Clontarf, leading to inconsistencies that read like a confused recollection of events. However, in conjunction with other documents, the literature can provide insight into different aspects of the battle itself. The site of the battle appears to have taken place further west than the modern suburb of Clontarf, probably at a ford site on the River Tolka near modern-day Ballybough bridge. The River Tolka’s estuary is a difficult fording place, which may explain the account of many Vikings, described as people of the sea, drowning as they retreated back to Dublin. Despite the differing accounts which form the Cogadh Gaedhel re Gallaibh, it is clear that this text has much to offer in the description of the Battle of Clontarf in 1014. Our seminar series continues on 1 December 2015 with Thomas Owen Clancy (Glasgow) discussing ‘On our terms: “Celtic” and “Celts”‘. This marks the Tenth Annual Angus Matheson Memorial Lecture and will be held in the Lecture Theatre of the Sir Alexander Stone Building at 5.30 pm.